I have not posted in a while, but that is because I have not been making new recipes recently. We have so many great recipes on this site, and I had fallen into a trap of cooking the same 4 or 5 things because they are so tasty. Yesterday I decided to browse my list of “to make” recipes and came across one that for months I kept meaning to make. When it came down to buying the ingredients, it always just looked a little too healthy. Since the holidays are around the corner, I thought it best to start getting the health in now. 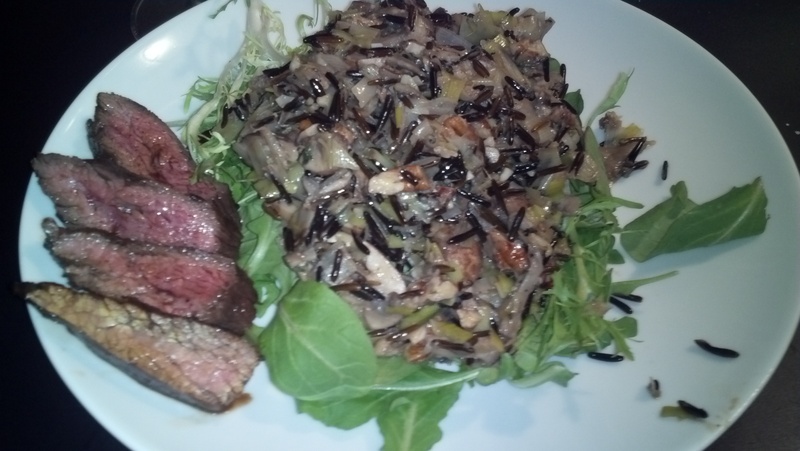 This is a recipe for mushroom and leek wild rice I saw on Closet Cooking, with my own tweaks. It is so tasty and surprisingly filling. It reminds me of a healthier version of my mushroom and leek risotto recipe! I highly recommend making this. I served the rice over a bed of baby greens and added a couple slices of skirt steak for extra protein (quickly marinated in a soy, garlic, onion, sugar mixture and grilled). Simmer the wild rice in the broth on medium-low heat, covered, until it is tender and it has absorbed all of the broth, about 50-60 minutes and remove from heat. Drain excess liquids. Heat the oil and melt the butter in a large dutch oven/pan. Add the leeks and saute until tender, about 10 minutes. Add the mushrooms, thyme, salt and pepper and saute until the mushrooms are just starting to caramelize, about 10-15 minutes. 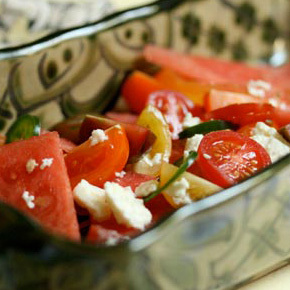 Like any good Southerner, I love watermelon… Mmkay, you know what? In the spirit of exhaustion and honesty this post-Music Fest week, Imma be real with you: I’m not really a fan. I’ve choked it down at every Fourth of July catfish fry, I’ve tried it with salt (and if salt can’t help me, honey, I don’t know what can), and I’ve even had the vodka-soaked variety and frankly, I’ll leave it. But as with so many things I’ve traditionally disliked, The Chef has found a way to make it not only palatable but actually good. Bacon, tomatoes and cheese have a hand in that, but the watermelon itself actually gets a dose of personality here, so go on and get out and proud and pretty with this one. You won’t be sorry. Get mixy and then serve atop spring greens. That’s all folks.